The twelve youth basketball players nominated to play for France U18 at the FIBA Europe U18 European Championship for Women Division A in Bucharest have been confirmed. The roster consists of nine players from the CFBB including Olivia Epoupa (in picture), two players from Bourges Basket and one player from USO Mondeville. 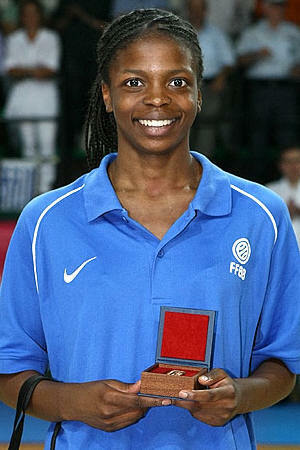 Pauline Lithard who is currently playing for Bourges Basket was a member of the CFBB during the 2010-11 season. Jérôme Fournier who is the head coach started his selection process much earlier than in the last few years with a camp in February. He also had a second camp in April and then made a decision of who would be called up for the second phase of the selection process which started on 16 June 2012. No official communiqué was issued on the numbers of players invited to the different training camps. Due to our presence at the 2012 Olympic Qualifying Tournament for Women in Ankara it was not possible to cover the 2012 Rezé Basket International (RBI). France won the RBI competition by defeating Croatia in the final (53-40). The coach of the Croatia team, Zeljko Ciglar, is the father of Croatian international and future Perpignan player Iva Ciglar. To qualify for that final, France had beaten the Netherlands (70-54), Belgium (74-30) and the Czech Republic (66-41). The players had another two weeks of camp before the team travelled to Turkey for a 4-nation tournament with Belgium, Netherlands and Turkey. France beat Belgium and the Netherlands (69-54) and (64-60) respectively but lost to Turkey (50-57). The final 12 players selected for the U18 youth basketball festival in Bucharest arrived in Romania for the final training camp on Monday, 23 July 2012. France lost to Belgium (49-77) in the final of the Global Vision FIBA Europe U18 European Championship for Women 2011 and will be hoping for at least a top 5 finish to qualify for the 2013 U19 FIBA World Championship for Women in Lithuania. France start the U18 European Championship in Group A with Poland, Spain and Sweden.